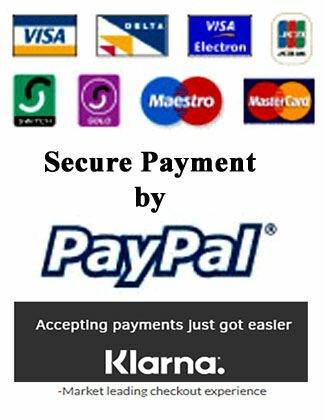 if we are not paying eBay fees - neither should you! 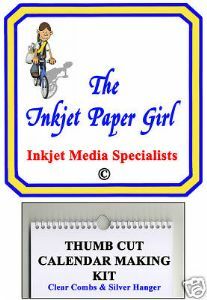 Get your cameras out and order your inkjet paper now! "The special unbreakable polypropylene binding combs just click, pop or zip open when you insert the top of a ball point pen or similar. Simply dismantle your Calendar and print your desired text, pictures, cartoons or graphics on to the pages for complete personalisation. This completely Blank Calendar has 9 Double Sided Gloss/Gloss Blank pages for your total customisation. Your computer will need to have a basic photographic manipulation programme for you to be able to rotate, re-size and add text, if required, to your pages. When printed, re-assemble your Calendar and pop or click your binder bombs back together by hand. Open and close the binding combs as often as you wish. No binding machine is required. Our Calendar Kits are the ultimate answer to quality, personal, fully customised, unique Calendar production. 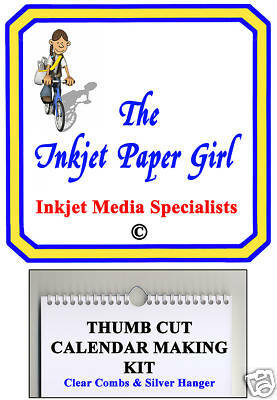 We have done all the work for you - just add your pictures, your words and that special personal touch. Check out our other Binder and Hanger colours, Multiple Purchase Deals, range of Calendar Accessories and as always lots of our other exciting inkjet products." For your convenience UK Freepost is included in the price - so when you purchase a single item you know exactly what you are going to pay. However, when purchasing multiple items the built in Freepost may well exceed the actual cost of postage and packaging, in which case you will be refunded the overpayment. All our P&P is at cost. No hidden charges. We mainly use Royal Mail 1st Class post. Heavier items are sent Next Day Courier - please ensure someone is available to sign for the delivery. Please let us know if you DO NOT wish to have a courier delivery. If you require Special Delivery or Recorded Signed For - please e-mail. Easter and Birthday Card Blanks - we have the range - Matte, Glossy and Luxury Glossy. A5, A6 and Panoramic - you are spoilt for choice! Extensive Range of Canvas Inkjet Media - Matte, Glossy, Silk - these are all woven fabric - NOT textured paper. The Real McCoy! We have Specialist Inkjet Media - Crystal Clear Self Adhesive PVC and PET Film, Polypropylene Film, Bright White Self Adhesive Vinyl, Single Sided and Double Sided Cold Lamination Protective Self Adhesive Film - stick anything you like to a smooth, dry surface. Creative or what? It is never too late or too early to print a Calendar, we stock them all year round, Birthday to Birthday perhaps? Go and hang yourself on someone's wall! Got a new A3+ Printer? Then look at our A3+ papers - we have a great Matte Art Canvas and a superb heavy weight, top quality Resin Coated Paper. Join the Professionals! Need Grey Board in heavier weights or custom sizes? We have it cut to our instructions - always a pleasure to quote! Lovely Customers so far and more everyday!